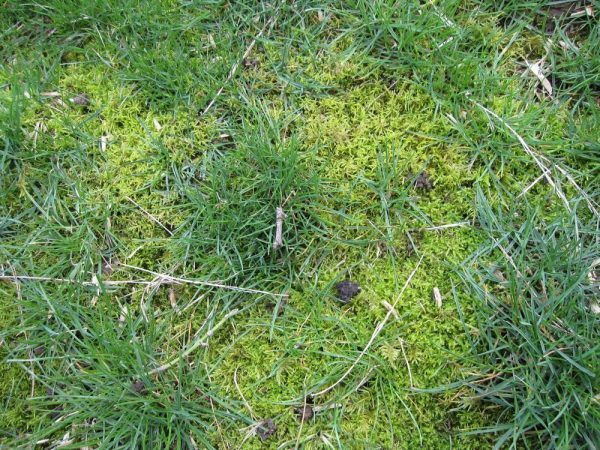 A few weeks ago we wrote about what conditions cause moss to grow on your lawn. Usually the best way to get rid of moss is to dig it up and re-seed. But did you know you can use our Liquid Iron to kill moss, too? High concentrations of iron are toxic to moss and weeds, and can kill them without the use of toxic chemicals. Be careful when you apply, however–getting the higher concentration of iron on your lawn can harm the grass, too. Mix the liquid iron at 2 oz per quart of water, 8 oz per gallon. Using a pump or trigger sprayer, wet the moss well with the iron solution, being careful to avoid spraying the grass. Test a small area first–the moss should turn blackish brown within 24 hours. If it doesn’t, increase strength to 9 oz Liquid Iron per gallon. Grass may turn brown if over applied but it should recover. Bonus: whatever Liquid Iron you have left over can be applied at the regular rate later in the season when you want to green up your lawn without encouraging more growth!